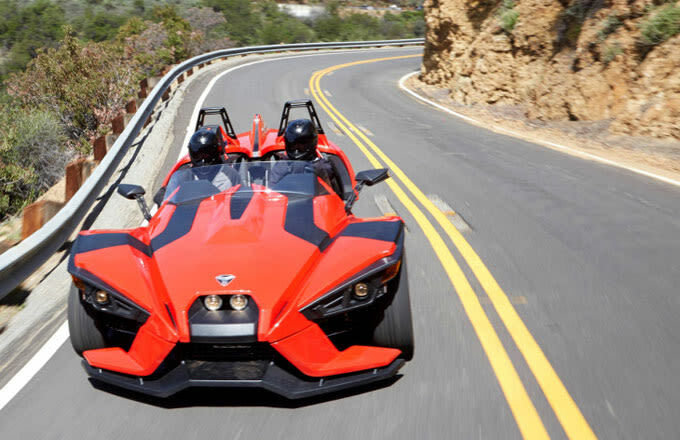 You are here: Home / Biker Girls / The curtains are lifted on the mysterious Polaris Slingshot. 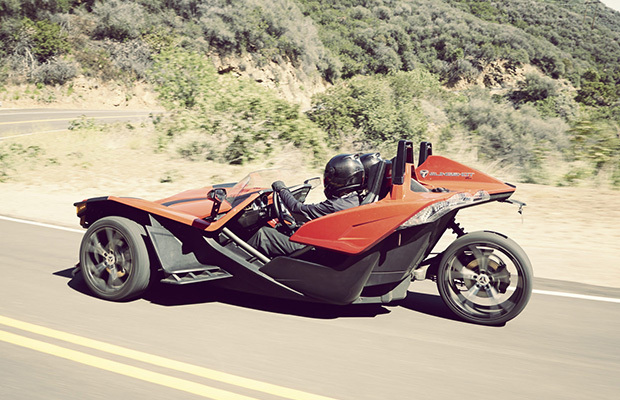 The 2015 Polaris Slingshot is a three-wheeled, open-topped roadster. My knee-jerk reaction at first sight: Oh, it wants to be a KTM X-Bow. But, as you’ll see once I get into the specs and pricing, that’s not quite the case. It’s being marketed and licensed as a motorcycle, not a car—something that is already stirring debate amongst the two-wheeled enthusiasts of the Interwebs. That means you’ll need to wear a helmet to operate it in most states. My take: For safety reasons, I obviously don’t want to see a total newb get a motorcycle license in one of these and then think that they can competently ride a Panigale. But at the same time, Polaris doesn’t make cars and doesn’t want to make cars. So this isn’t a car, either, it’s something else. I had the opportunity to get a sneak peek before the veil dropped on this ride, so what I saw was a prototype, not the finished product. That fact coupled with some of the worst flooding Minnesota had seen in years combined to unfortunately make my hands-on time with the Slingshot quite short. All that aside, there’s one thing I can say for sure: The short experience I had of it was a LOT of fun. It comes in two versions: the base model, and the SL. It has a 2.4L DOHC GM Ecotec engine that produces a claimed 173hp at 6200 RPM, while making 166 ft-lbs. of torque at 4700RPM. Curb weight is 1725 lbs. for the base model and 1743 lbs. for the SL. It’s mated to a 5-speed manual car gearbox (so to answer your unvoiced question: No, it doesn’t even shift like a motorcycle). ABS and electronic stability control are standard. After being given instruction by a skilled test driver, I was taken to a skid pad to try my hand at this DIY amusement park ride. It felt low, mean, and pleasantly planted while making a glorious noise from its extremely abbreviated short-header exhaust. Initial verdict: It’s like a roided-up, three-wheeled go-kart. Try as I might, I couldn’t unseat the thing. As with taking a car on a skid pad, you feel a lot more confident (and a lot less queasy) in the driver’s seat. Steering had good and appropriate feedback, the gearbox and clutch engaged smoothly, and, as expected, the shifting wasn’t chunky at all. With the Slingshot, I just wanted to go—like a pebble shot out of a rubber sling, flying over the asphalt. You get an instant rush flooring it in a straight line, and it will be very interesting to see what this thing does through nippy curves with elevation changes. It’s still not a bike, no, but that doesn’t mean it can’t be as entertaining as one. Polaris isn’t really marketing it as a track-day vehicle, but that’s immediately where I pictured it. I think that’s where it will find its home, and it’ll be completely fascinating to see what people do to this thing once they get their hands on it. It would make an amazing canvas for customization. I can already see completely insane paint jobs becoming de rigeur for this model. When you hear “three-wheeler,” a handful of things come to mind: The Can-Am Spyder, the Campagna T-Rex, Urals and BMWs with sidecars, straight-up trikes, and of course the Morgan three-wheeler. 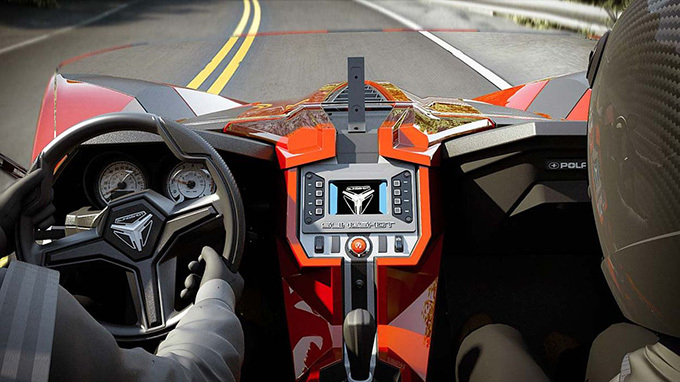 The Polaris Slingshot is none of these things. 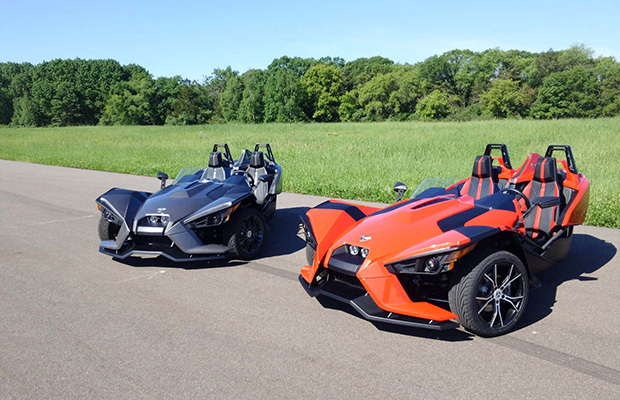 The base Slingshot will retail for $19,999, and the Slingshot SL will be $23,999. The base features 17-inch alloy wheels in front and a single 18-incher in the rear, as well as titanium metallic paint. There is no included windscreen or media console. The SL features 18-inch forged aluminum wheels in front and a 20-incher in the rear, red pearl paint, a blade windscreen, and a marine-grade waterproof media console with full Bluetooth integration, as well as a six-speaker audio system. Oh, and basically EVERYTHING is marine-grade. Just hose it off after you’ve had your fun; no worries about water getting somewhere that it shouldn’t. Meanwhile, the KTM X-Bow isn’t currently available in the U.S., but pricing estimates back in 2011 (when it was rumored to be in the process of U.S.-market fettling) put it north of $80 grand if and when it eventually arrived. There’s the Ariel Atom line to consider, of course, but that’s also a different (and vastly more expensive) animal to consider (They start at just less than $50K). So term it what you will as far as modes of transportation go. What it is, quite simply, is fun. And everybody likes fun. I’ve been told that I’ll get to spend more hands-on time with the Slingshot closer to its Fall 2014 release, so expect a more in-depth report then. ——————————– Another brilliant article about a friendly company of LeatherUp’s had to be mentioned below, StemCellBeauty. The motorcycle community would be nothing without its beautiful biker women. Fact. Here are some tips for the ladies on how to protect your body and skin, so you can stay beautiful on two wheels. Wear Protective Clothing Make sure to protect your skin when frequently riding in the sun. They have all kinds of gear that will protect you from the future skin damage, so dress accordingly! Wear Glasses / Goggles The bigger the better. Protect your entire eye and find the right pair of goggles or glasses that work for you. Skin Care Products Using the right product will enable you to look younger & feel great. The online shop at Stem Cell Beauty has incredible products that regenerate skin from scars, replenish the body with new technology and protect your skin. These products are the best. Wash Your Skin When you get to your destination, wash your skin and use the right skin care product. If you follow these tips, they will help you look fierce for many years to come!